APC governors adopt Buhari consensus candidate – Royal Times of Nigeria. 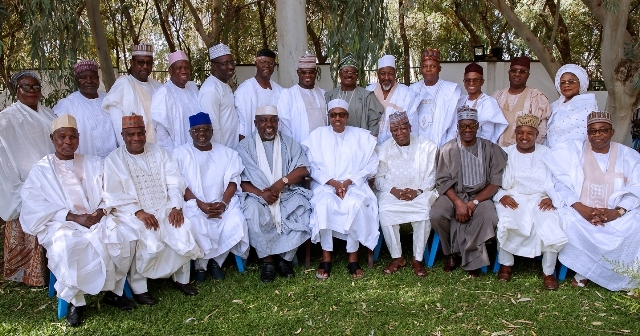 All the 24 governors elected on the platform of the ruling All Progressive Congress(APC) on Tuesday night announced their endorsement of President Muhammadu Buhari’s candidature for the 2019 presidential election. According to him, the meeting also addressed the forthcoming convention and congresses in order to make it hitch-free. He added that “we also agreed that we will not allow the issue of many contestants to destroy our party. APC state governors in attendance were; Nasir El-Rufai of Kaduna state, Yahaya Bello of Kogi, Simon Lalong of Plateau, Jibrilla Bindow of Adamawa and Abdulaziz Yari of Zamfara. Others were Rochas Okorocha of Imo, Abdulahi Ganduje of Kano, Kashim Shettima of Borno, Abubakar Sani Bello of Niger, Tanko Almakura of Nassarawa, Abiola Ajimobi of Oyo, Ibikunle Amosun of Ogun, Godwin Obaseki of Edo and Abubakar Badaru of Jigawa.